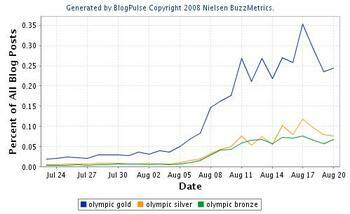 Here's a few fun "data" views from Nielsen's BlogPulse monitoring tool, which tracks nearly 80 million blogs daily. You can run your own trend charts. 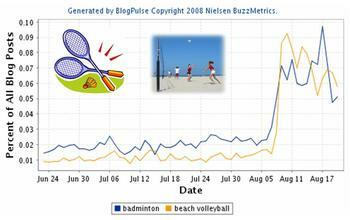 Don't Dis Badminton: In the blogosphere at least, the birdie stayed in play with the hot, hip sands of beach volleyball. Is Bela Karoyli the next Howard Cosell? 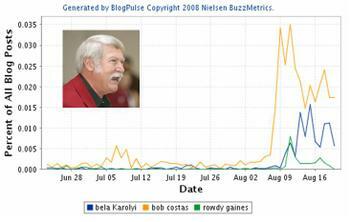 You never know, but at one point he nearly eclipsed Costas on blog mentions. Gold Glitters -- Disproportionately: Yes, indeed. If you are still hungry for Olympic data and bloggage, my work colleague Jon Gibs is blogging away on Nielsen's Analyst Blog. I thought I'd take a spin through a few 2006 trends and developments as reflected in CGM. This is where CGM text-mining and analysis gets really interesting. Indeed, you can look across vast quantities of unstructured to data to glean a unique view into trends, head-to-head brand match-ups, even spectacular flameouts. 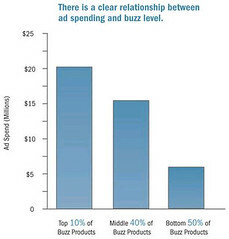 The charts below are from the Nielsen BuzzMetrics (my day job) toolkit. 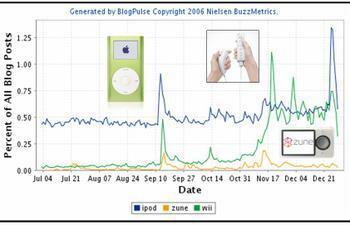 2006 Gadget Wars: On the electronics front, iPods continued to not only facilitate the creation of CGM through playlists and new video features (even the playback of home movies) but also continued to drive so much of the buzz and conversation online related to consumer electronics. While Microsoft's new music player, Zune, just entered the market, it hasn't yet made a huge CGM splash, and that may stem in part from the fact that folks are still testing it out before offering their first hand testimonials. Nintendo's Wii Player, by contrast, has seen an impressive explosion of buzz, stemming not only from highly enthusiastic post-experience buzz, but conversation (and frustration) related to where and how to find the much-in-demand player. Next gadget battlefield: the CES (Consumer Electronics Show) next week in Las Vegas. One Word CGM Tipping Point: Macaca: Who would have guessed the balance of power in the US Senate would rest on one word: macaca? This was the term former (yes, hard to believe...this guy was slated to run for President) Virginia Senator George Allen used to describe a worker for his opponent's campaign during a speech that was subsequently captured on YouTube. The incident and term, considered a racial slur, found permanent residence not online online in the blogosphere (see chart) but also on YouTube, where the remark was watched (and replayed) hundreds of thousands of times. 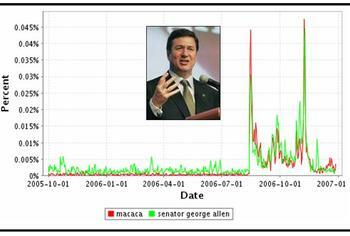 As you can see from the chart, the vast majority of blog buzz Allen received in the critical last phase of the campaign pertained to the "macaca" term, and no one, it seemed, including the national media (which draws heavily from blogs and CGM2) could let it go! He lost the election by a razor thin margin, and now the Democrats hold power. The power of CGM! YouTube Trumps the Tube? 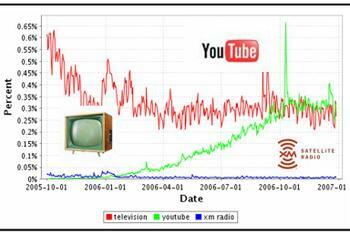 Even with Donald Trump, the term "television" found some real competition with YouTube, which advanced in 2006 from a sliver of online conversation to a level few would have guessed. But there's a critical lingering question: did YouTube trump television, or did it facilitate the rebirth and repositioning of television to a new platform. TV and cable networks, without question, are now among the most aggressive users of YouTube to seed, disseminate, amplify and reinforce their offline content, and now we're seeing the same approach spillover into advertising. (Just wait till the Super Bowl!) They are also using YouTube as a non-regulated channel to make available "not ready for primetime" content (pun intended). Story to watch in 2007: the continued renaissance of the medium formerly known as television. Trust me, TV is not going away. Swedish H&M Finds a Buzz (and sales) Niche: The first time I walked a fast-growing Swedish clothing retailer H&M's doors, a year ago last November in San Francisco's Union Square, I went nuts. The environment was electrifying, the crowd was funky, the clothing had an edge (but without being totally over-the-top), and the prices were outrageously accessible. While I only bought a t-shirt for myself, I loaded up on goodies for my wife and kids (including funky neclaces and brakelets and earings), which yielded happy and grateful yet incredulous ("how could you buy such hip stuff") looks. If you carefully analyze the buzz related to H&M, especially among teens and tweens, you'll understand why it's rising in the charts. Signing up Madonna as a model undoubtedly helped the buzz factor, but the brand affinity here is deeper. Intense might be a better word. 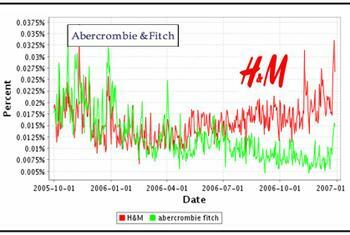 Get's especially interesting when you company H&M related conversation relative to brands like Abercrombie & Fitch, Gap, and Banana Republic. Will this hoopla last? Well, when guys like me start raving about the brand, you never know whether the true cool kids will hang one. But the stores keep popping up all over the place, so someone cool must still be talking. 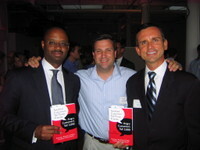 Triumph of New Marketing Models: 2006 taught us lots of great lessons about the "new marketing." What we don't know for certain yet is how much of this we can bottle up for future use (At P&G all our key lessons went into massive white notebooks -- or "Fact Books" -- which always carried an expectation of "reapplicable" use). On YouTube, we saw a largely unknown band "OK Go" dramatically rise in both the buzz and sales charts on the basis of low-cost, yet highly originally, and wildly "passed along," video featuring guys doing the treadmill equivalent of synchronized swimming. Oh, and their music isn't bad either. We also saw, and continue to see, lots of buzz around Bono initiated "Red" campaign, which earmarks a percentage of revenue for select product to address the African aids crisis. 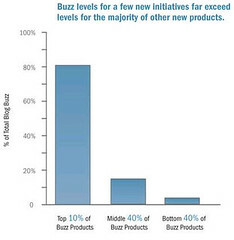 That said, I'm surprised (and disappointed) the level of buzz hasn't been higher, and I wonder whether the Red campaign (at least so far) has missed opportunities to real consumers (or people...which ever term you prefer) in the message creation. 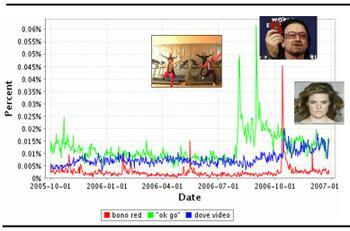 Even on YouTube, the Red videos are not getting as much pick up as you might expect. (Footnote: some of the video-reactions to the Red campaign are quite good and insightful...here's an example.) Which brings me to Unilever, which produced what I consider to be one of the best marketing campaigns of the year in the form Dove Real Beauty, especially the "Evolution" video, which drew strength from what I term consumer-fortified media. Lots of excellent learning here, and I have lots to say about this in one of my ClickZ columns entitled "Real Beauty, Real Breakthrough." 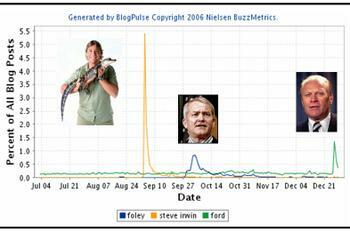 Crocodile Man Bites Big into Buzz Share: As personalities go, Steve Irwin topped the charts this year into terms of buzz and conversation. Whether it's because we love him or our kids love him, his tragic death hit a nerve, and we all talked about it. And we also linked to him via Wikipedia more than just about any other term in 2006. Meanwhile, Mark Foley triggered enough buzz to create a mess for Republicans leading into the mid-term elections, and Gerald Ford triggered a huge still-continuing level of (mostly respectful) conversation about his Presidency, his role as national-healer in the wake of Watergate, and of course, his still-controversial decision to pardon former President Richard Nixon. Per my earlier post regarding the "Engagement blog," I strongly -- nay, loudly -- encourage you to check it out. It's more than a blog; it's de facto on demand TV. 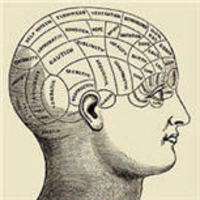 OK, not exactly, but there are enough thought-leader videos to keep you engaged for some time. Moreover, my colleague (and Engagement blog maestro) Max Kalehoff pens some thoughtful and reflective commentary per last week's Advertising Research Foundation's (ARF) research conference. Other content from the blog includes: notes from the Gerald Zaltman (see my book reco below) speech on so-called "Depth Deficit," notes from Taddy Hall preso on "winning," notes on panel discussion re: "Measuring the Turn-On" moderated by Barbara Bacci-Mirque of ANA, notes from NBC's Alan Wurtzel on media measurements, notes from Patrick Keane of Google and Lisa Baird of NFL, and notes on Joe Plummer preso (also see Max's MediaPost Joe Plummer interview), and ARF's Bob Borocci event kickoff. Video snippets include Gerald Zaltman, "Father of Media Planning" Erwin Efron, AAAA's Mike Donahue, CNET's Ted Smith, ZenithOptimedia's Bruce Goerlich, Interactive Television Alliance's Bed Mendelson, Nielsen Media Research's Paul Donato, Big Research's Joe Pilotta (lots of constructive criticism re: engagement), Nielsen NetRatings Mainak Mazumdar, Ogilvy's 360' Digital Influence's John Bell, Comscore MediaMetrix's Jack Flanagan, AC/Nielsen's Mark Green (podcast format), ANA's Barbara Bacci-Mirque, Millward Brown's Michelle de Montigny, 360i's David Berkowitz, MediaWeek's Michael Burgi, and Noah Brier. 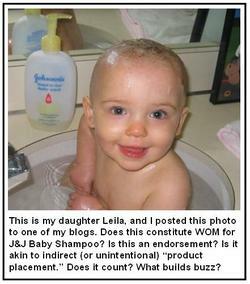 Jim Nail also offers some thoughtful comments on his blog. One of the most popular webinar's I've led or co-led this year is entitled "CGM and Engagement," and the key theme is whether a consumer's propensity to speak out or express themselved online represents a form of so-called "engagement." It's a timely question, because engagement has become a new rallying cry for fresh new thinking about advertising effectiveness, and everyone, it seems, is jumping into this important conversation. Toward that end, I'm participating in a blog my colleague Max Kalehoff initiated on behalf of the Advertising Research Foundation (ARF) to create a more sustained and spirited dialogue and conversation this topic. It's name, true to its mission, is "Engagement by Engagement." Expect to see lots of great content, including video interviews with key thought-leaders. Are you ready to engage. Back to the Web 1.0 Future? "...after rummaging through an old box of articles, conference trinkets, and memos from my late 1990s stint as co-leader of Procter & Gamble's early interactive efforts, I'm convinced the core fundamentals were in place before we even heard the term "Web 2.0." I raise this question not to pooh-pooh the current Web 2.0 exuberance but to ground it in a more stable set of fundamentals. As marketers, and certainly at the CMO level, we have a deeply rooted penchant for preaching the new while funding the old. Among the core "1.0" tenets cited: (1) The web is a focus group of unlimited conversation, (2) Digital is the most measurable medium, (3) Content is king, (4) Brand websites nurture trust and conversation, (5) Deeper engagement matters: advertise that URL, (6) Time to shift from branding to bonding, (7) Behold the "Network Effect," and (8) Influencers Matter. Again, here's the link. For deeper perspective on my point about the value of brand websites, please see the following excellent post by Laurent Flores. Welcome your feedback! Here at Nielsen BuzzMetrics, where I serve as CMO, we're looking for to fill a key marketing position. Here's details. Job will be based in New York, and you'll be working with a fast-growing team of passsionate experts in consumer-generated media. Check it out!